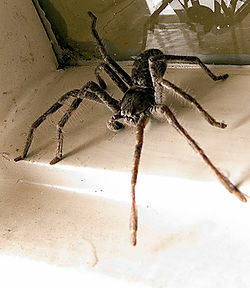 The Huntsman Spider lives in tropical areas of the world like Australia, Asia, and southern parts of the United States. They include any of the species of the taxonomic family Sparassidae and are also known by the common names giant crab spider and wood spider. Huntsman spiders have large, hairy bodies with eight long legs. At first glance, some large types of huntsman spiders can be mistaken for tarantulas. Although they are not tarantulas, they strongly resemble them with a name meaning "Australian Tarantula." Their complete leg span varies from about half a foot to a foot in length. Their bodies are usually a flattened shape, convenient for living in narrow spaces like in cracks in rocks or under pieces of wood. The only two types of huntsman spiders without a flattened body are Brown (Heteropoda) and Badge (Neosparassus) spiders, which are distinguished by their black, white, orange, or yellow abdomen area. It also has a bite that will inflict a more serious injury than other types. It can give local swelling and pain strong enough to cause nausea, headache, vomiting and heart palpitations. Also, huntsman spiders' legs are equipped with joints bending forward, as opposed to other spiders with joints running vertically. This is useful when trying to fit into tight areas. By using this function, they can walk like a crab instead of having legs that poke out and get them stuck. These spiders' color is a greyish brown shade. Their bodies appear smooth, but their legs are covered in little spines. Huntsman spiders have eyes with sight not as good as most spiders, but good enough to let them see large objects like humans and animals. Some male types of huntsman spiders use sounds when female huntsman spiders are close around. They can sense that the females are nearby by a chemical pheromone let off by the females' bodies. The male holds tight onto the surface they are on and uses a body vibrating technique with their abdomen that makes the noise for the female. Once the female is attracted to this sound, they sexually reproduce. Unlike some kinds of spiders, female huntsman spiders do not attack the male after the courtship. Once fertilized, the female produces a flat, oval egg sac made of white papery silk. They can then lay up to two hundred eggs. She places the egg sac in a protective place, like under bark or somewhere else safe. She guards it with her life for about three weeks, the whole time not eating any food. During this time, the female will have an aggressive attitude and can think of any visitor as a threat to her eggs. Once the eggs are hatched, the mother will stay with the spiderlings for several weeks. Some types of huntsman spiders will actually carry their egg sacs underneath their body wherever they go. Female Delena huntsman spiders create a ground-sheet of silk to lay her eggs on. The female Isopeda huntsman spider will actually help the young out of the egg by tearing it open. Huntsman spiders have different lengths of incubation periods, possibly due to differences in conditions of climates. The newly born spiderlings have a pale, slightly green color. While they go through several moults with their mother, they become darker and harder. This moulting process is necessary for growing. Sometimes, when the moulted skin is left behind, it can be mistaken for the huntsman spider's actual body. 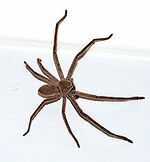 The huntsman spider commonly lives in wooded areas, where they can find loose pieces of barks to make shelter under. Sometimes, if bark or rock crevices are not in sight, they will find shelter in homes or vehicles. This spider lives in various places in the world, especially Asia, Australia, and southern United States, but they try to maintain a tropical to semi-tropical climate. Their flat bodies' ability to fit into small areas and their ability to adapt to human environments explains why they are constantly being found in houses, cars, sheds, and places like these undercover. Huntsman spiders are cold sensitive, and cannot survive out doors with freezing temperatures. Although they may occasionally bite, huntsman spiders are not too much of a threat to humans. They feed on insects in the woods. They usually will not bite a human even if provoked, but sometimes, especially when a female is guarding newly birthed eggs, they can become aggressive and find humans as a threat and they will bite. When they bite humans, the pain inflicted can cause vomiting, fever, headaches, and speeding of heart rates. 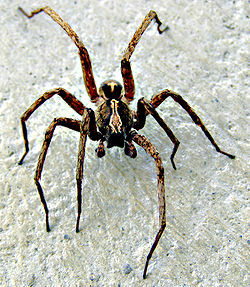 The huntsman spider was discovered in the Greater Mekong Subregion, an area in Asia, around the turn of the millennium. Nearly one hundred different species of huntsman spiders have been discovered in Southeast Asia, Australia, New Zealand, Florida, the Mediterranean and Hawaii. Within 1997 to 2007, there were more than one thousand new species found. Recently, around the end of 2008, a huntsman spider had been discovered that was said to be a world record setting spider. It was the largest huntsman spider from leg to leg ever seen. The World Wildlife Fund (WWF) announced that it was found in a Laotin cave. This spider was named Heteropoda maxima. Across, from leg to leg, it measured thirty centimeters (almost one foot). Scientists said that it was the most remarkable of the nearly one hundred new species of spider that were discovered in that ten-year-long wildlife study of the Greater Mekong Region of Southeast Asia. During this decade-long wildlife study in Asia, there were also more than one thousand new species of animals and plants along with more than a thousand new species of microscopic invertebrates. Wikipedia Sparassidae multiple authors, Wikipedia Huntsman Spider. Huntsman Spiders Austrailian Museum Australian Museum, 2003. Animal Corner Huntsman Spider Unknown author, Animal Corner. Linkroll Huntsman Spider unkown author, linkroll.com. Huntsman Ed Nieuwenhuys, Ronald Loggen, Jurgen Otto, 5 November 2006, March 2005, April 2006, xs4all.nl. This page was last modified on 28 March 2009, at 23:12.